There’s a man living in Sun City Grand doing extraordinary things all in the name of Golf. Three times a week, Chuck Passo hits the links at the golf courses in Sun City Grand. “I like the fact that you can hit the ball and get rid of frustration,” Passo joked. It’s been his passion since 1986. “My wife and I both took up the game, and it became something we like to do together,” Passo said. But, Passo is no ordinary golfer. In 2000, he lost both of his legs to Buerger’s Disease, a rare vascular disease that required 14 surgeries on his legs before they had to be removed. 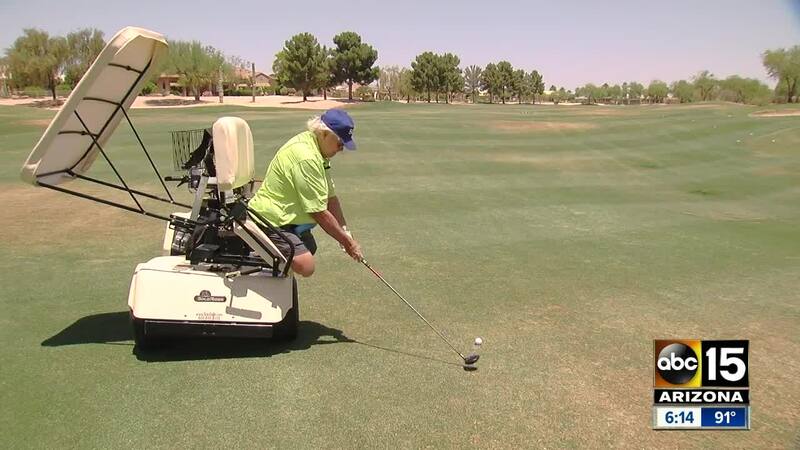 Passo uses a Solorider; it’s a specialized golf cart that accommodates golfers with disabilities. The golf cart swivels away from the steering wheel, and with a push of a button, the hood moves back as the seat shifts forward to allow Passo to get into position to hit the ball. “It’s very different, you can’t turn your body, you can’t turn your hip, you can’t load on the left or right side, you’re up and down the line more,” he said. The managers at Grand Golf who operate the three golf courses in Sun City Grand bought three of these Soloriders at the cost of $11,000 after Passo asked for accommodations so that he could get back on the course again after his amputation. “Our goal is to grow the game of golf, and anytime we can get another golfer out on the golf course, and this is just one of the means to get it done,” said Jeffrey Hochman, Grand Golf Director of Operations. This specialized golf cart gives Passo the ability to work on his swing and gain more independence on the course. He says it hasn’t always been easy, but all that hard work came together on a big day. “We had a big wind in our face; the hole was playing about 128 yards,” he said. That day he hit a hole in one on a par three at the Desert Springs Golf Course. A feat that not only surprised him but his wife and friends. “It was a good feeling, you know, a hole in one is a good feeling no matter what, whether you have legs or not,” he laughed. Passo says some of the other courses he went to didn’t have these golf carts, so he’s happy these courses do so he can keep enjoying the game he loves.